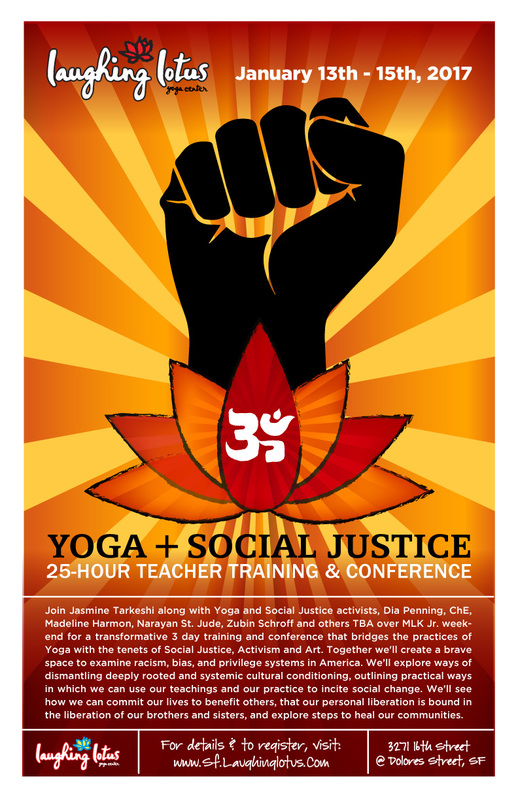 The Yoga & Social Justice Teacher Training and Conference will be happening at the Laughing Lotus in SF this January. Join Jasmine Tarkeshi, Dia Penning and Madeline Harmon along with experts in Social Justice and the Yoga for a transformative 3 day training and conference that bridges the practices of Yoga with the tenets of Social Justice and Activism. Based in the fact that the worlds great problems are connected to the split we create, between ourselves and others, this training will bridge the teachings and practices of Yoga with social justice and activism. We will see how we can commit our lives to benefit others, that our personal liberation is bound in the liberation of our brothers and sisters, and explore steps to heal our communities. This Training and conference will include an exploration of the main themes of Yoga Philosophy and Social Justice through personal inquiry, group discussion, habit exploration and reforming, Asana, Pranayama and Mantra. All in order to to invoke personal change and action, transforming our inner dialogue and outer practices. Together we will create a brave space to look at racism, bias, and privilege systems. Exploring ways of dismantling deeply rooted and systemic cultural conditioning, outlining practical ways in which we can use our practice and teaching to create social change. Yoga and meditation are often perceived as solely internal, individual practices. Yet these practices can also be undertaken to promote positive social and personal developments that benefit the greater community. The concern for the social welfare of both the world and its people is essential to the practice of Yoga and for the sake of transformation and social justice. Historically, Yoga and meditation have been instrumental in facilitating social change. This Yoga Social Justice Training will offer practitioners and teachers an opportunity to explore these various subjects and will include in a panel discussion, open to the public, followed by a celebration of Dance, Music and Art to promote awakening! Join them on their FACEBOOK PAGE.